The dynamic disk is not supported for the UWF. The Unified Write Filter (UWF) is a feature that protects physical storage media from data writes. UWF intercepts all write attempts to a protected volume and redirects those write attempts to a virtual overlay. This improves the reliability and stability of your device and reduces the wear on write-sensitive media, such as flash memory media like solid-state drives. Read our documentation on the Unified Write Filter for more information. If you do not have the current version of the Windows 10 IoT Core Kits yet, download and install the Windows 10 IoT Core Packages. Based on your device architecture, copy UWF packages ( Microsoft-IoTUAP-UnifiedWriteFilter-Package.cab and Microsoft-IoTUAP-UnifiedWriteFilter-Package_Lang_en-us.cab ) from your PC (C:\Program Files (x86)\Windows Kits\10\MSPackages\Retail\<arch>\fre\) to the device (for example, with Windows file sharing). Launch SSH or Powershell and access your device running Windows 10 IoT Core. The device will boot to the Update OS, install UWF features, and reboot to the MainOS. Once the device comes back to the MainOS, the UWF feature is ready and available to use. This can be verified by typing uwfmgr.exe into your Powershell or SSH window. Create the image\FFU. Read Create a basic image for instructions. 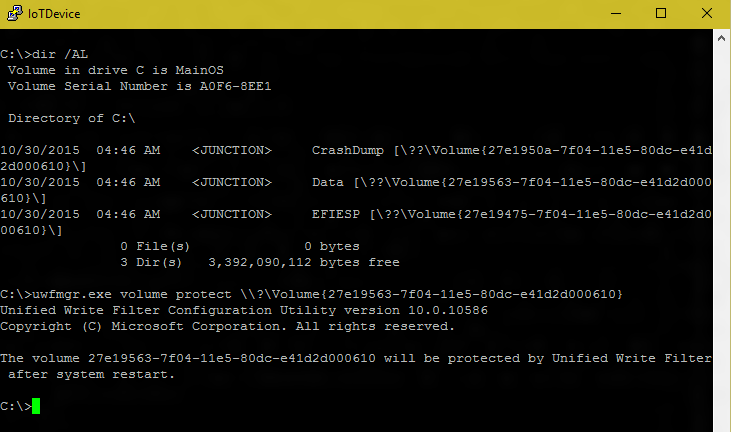 UWF can be configured using the uwfmgr.exe tool via a Powershell or SSH session. Read uwfmgr.exe tool for the available options with an exception of some commands listed below that are not supported in IoT Core. Review the default settings of the Overlay configurations and adapt them per your requirements. 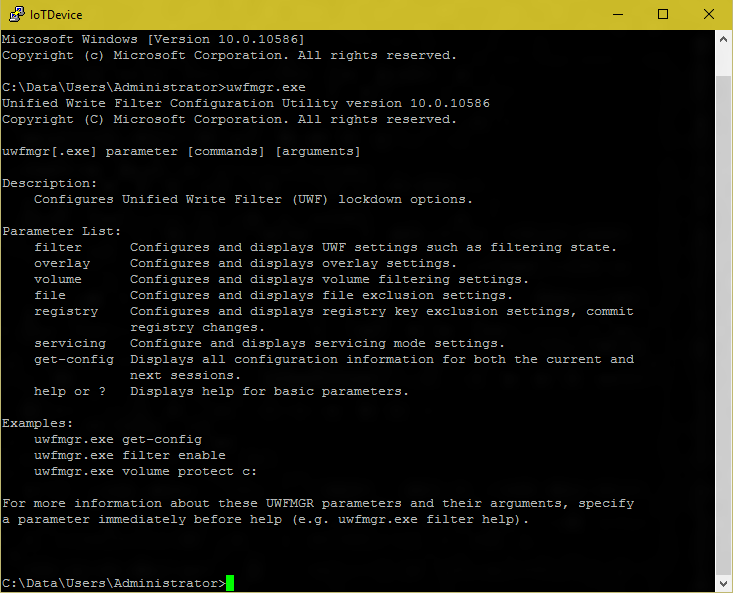 UWF can also be configured via MDM channel using Unified Write Filter CSP. Reboot is required to make all the uwfmgr settings effective. When protecting the data volume, we recommend that you add exceptions for the servicing and logging folders that are accessed by Windows OS Services. Starting Windows 10 IoT Core Release 1709, version 16299, the main OS volume (C:) can be protected with UWF and serviced automatically without any special steps. The following steps are required to service UWF protected devices with protected data volumes. UWF Servicing Mode is not supported in IoT Core. uwfmgr.exe on Windows 10 IoT Core does not support commands listed below.